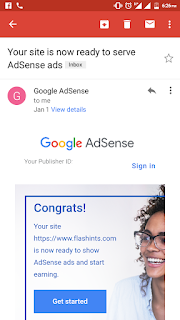 Today, I'm going to show you how to get google adsense approval trick(GAA) in 2019 with a month blog. It has become very difficult to get an GAA. It was not the case there, three to four years back, when we were able to get Adsense account approved with free blogs even created on blogger.com. 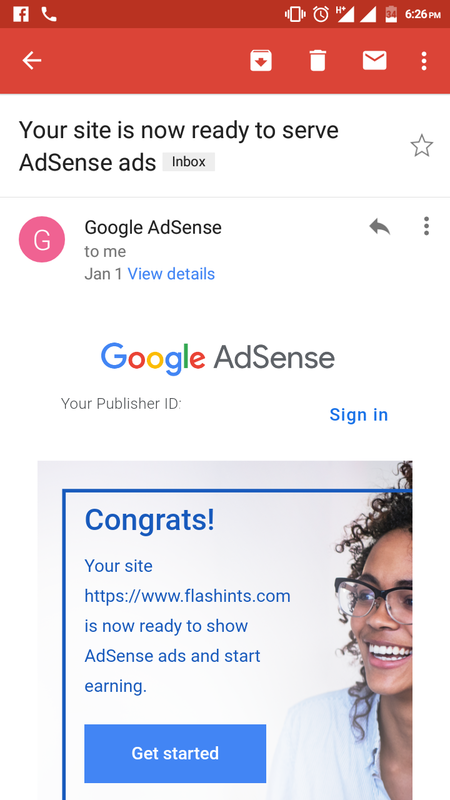 So today, I'm going to explain one after the other, I mean the full guide that will help you get your Google Adsense account approval very quickly and super fast in 2019. Before I proceed, let me ask you some few questions. Are you looking for fast Adsense approval within 24 hour, within a month blog or before 6 months. Are you looking for Adsense approval tricks and tips? how to get adsense approval for wordpress blog or blogspot. Anyway, I get my blog approved within 20 days old domain... Hmmmm are you surprised about it! The picture below is the prove. Hi guys, are you preparing your site for a Google AdSense account approval? And you always get rejected? Then you need to pay some attention to your website before you submitting it. Many new webmasters tend to make some mistakes which in turn could make their application being rejected. Therefore, before you enroll into it, make sure you pay attention to the topics listed below. 1. You must have a good quality content on your website. Please noted whenever you are submitting your application, make sure your website have good quality content. Visitors to your website come to your site because they could find good reading materials. That is what all visitors are looking for in a website. Google Adsense evaluation staff too are looking for this aspect. They are looking at your website content when they are evaluating your site. Get it! What do you understand by high quality content? Means it must be unique, free from grammar error and must be readable, They love post with 100% unique content which is free from plagiarism. Noted this is the number one caution to take when applying for Google. To get 100% unique content then your niche must not be on news only. Do multiple niches and once you get approved Google Adsense Account you are free to go on any niche you want. • Niche on Automobile (either auto repair or more) etc. How to check for plagiarism content? Use the online tools below to check the uniqueness of your article. Seotoolstation: Also free checker and more free tools. Also use the above tools to check for grammar error. 2. How many pages or post do you need to have before you submit your application For Google Adsense approval? Before you submit your site, make sure your site have at least five pages. Above pages are important because when you pass first approval stage, second approve stage will be review by human, not robot... In short your pages must look professional for the examiner. If not, I can't guarantee your approval. But make sure it look professional. 3. About posts on your website. Google never recommend the minimum number of pages or article required before an account will be approved, however from my experience and from many new webmasters it is highly recommended that you have at least 15 to 20 unique articles. I repeat, your article must be between 70-100% unique, must always free from plagiarism free. Also, your post must be classified or label. Don't just publish the article without relevant label or categories. Make sure on each page you have at least a link that will bring a visitor to the main site that have a navigation table. Also provide widgets like Blog Archives, Label, Recent post and About you. Why about you biographies, For you to get fully approved account "Google Adsense" want to know more about you even users, both want to know the article source. 5. Submit your website to Google search console. This is another important issue. Make sure your website have been launched to the world first before you submit your GA application. Many new webmasters have submitted their Google Adsense application before they have made their website live in the Internet. Off course your application will be reject because your site could not be found in the Internet. Make sure you do necessary things on Google webmaster tools by submitting your site map and much more. Remember your website must look professional. Setup your Google analytics and implement the code on your website. Although no webmaster recommends this, but it's part of my Google AdSense approval Method. Lots of websites get rejected because they don't have any real traffic. So your chance of being accepted into Adsense is rare if the blog you are applying with does not have decent amount of traffic. Although many webmasters say traffic doesn't matter, no traffic at all must have up to 50 page view per day before you can get Google Adsense approved. Notes: Use this when you don't have any means to get traffic. But when using it, you must mix the above tools to get quality traffic. 8. ENSURE YOUR BLOG DOES NOT HAVE IMAGE RESULTS, VIDEO, NEWS GROUPS AND MP3 DOWNLOAD. All the above tips matters and it will lead to copyright issues. Google Adsense has made it clear that they do not want to approve any application with websites having those materials listed above. 9. ENSURE THAT YOUR SITE DOES NOT CONTAIN, OR IS NOT ABOUT ANY OF THE TOPICS PROHIBITED BY GOOGLE ADSENSE. Website with "Violence, racial intolerance, or advocacy against any groups, individuals or any organization"
Pop-ups, pop-under or exit windows that interfere with site navigation, obscure Google ads, change user preferences, or are for downloads. Other types of pop-ups, pop-under, or exit windows may be allowed, provided that they do not exceed a combined total of five users per session. Website with Sales or promotion of certain weapons, such as "firearms, ammunition, balisongs (mobile handle butterfly knives,) butterfly knives, and brass knuckles"
Site or blog with Sales or promotion of "tobacco-related products or tobacco"
This is one of Google important requirement. Do not label GA with your own text. Google would label them when the ads appear and you should let it be as it is. You are not to encourage your visitors to click on the ads by labeling them in whatever ways. The visitor should click the ads on their own volition. Many webmasters recommend domain age between 4-6 months old, because it increases the chance of being accepted into GA. Apply with your Gmail account or brand new Gmail account. Some webmaster also recommends professional email, because it makes it look professional and increases the chance of being acceptable. Once you have completed the above process, then go back and submit your application again. I bet it with you, your application will be accepted. I guess this has been of help to those on the righteous part of blogging and wants to get Google Adsense account approved. It's very possible, just follow the guides above because those were the reasons I got approved within 20 days. What if you stuck on second Google Adsense approval stage? I will publish new post about that make sure you subscribe for more update.